Being able to walk away is tremendous leverage. What is the ultimate goal in this negotiation? How valuable or important is this deal to you? Walking away from a lease negotiation is predicated upon your BATNA: the Best Alternative To No Agreement. This means the offer you already have on the table is your BATNA- you cannot do any worse than that. When you are negotiating with a landlord and they know that you have another offer that’s better than theirs, you already have a strong BATNA. In this case you immediately have the landlord’ attention. This can help you a great deal from the beginning as you now have the upper hand. At this point, if you get to where you see no other option, you can walk away with no regret or hesitation because you know you have an alternative agreement. Never make a threat you are not willing to keep. A lot of times, walking away can be a very powerful tool. However, you cannot make this claim if you are not willing to follow through with it. If you use it as a threat, you have to be willing to walk away. If you do walk away, this might very well change the landlord’ position. They might even give in to what you are seeking. Sometimes, walking away seems like the only sensible option. 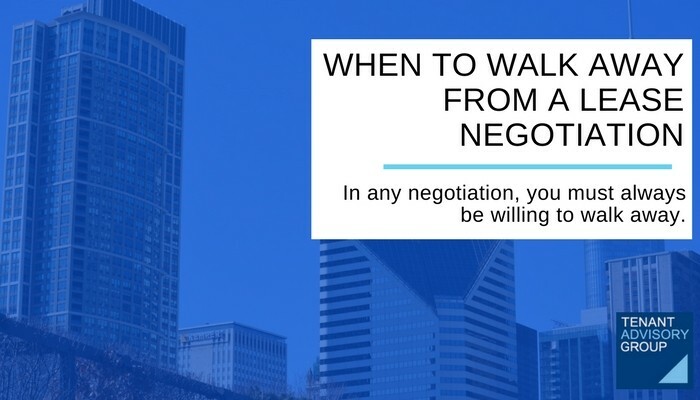 For instance, if the other side of the negotiation gets emotional, is making threats, or is lying to you, this should tell you that you do not want to get further involved with these people. TAG recommends starting the lease process far in advance, typically at least a year. This time immediately provides you with leverage, and gives you the advantage of being able to walk away without hesitation. You have the time to find another space or landlord elsewhere. The only time you should not walk away is when you have to do the deal. This circumstance immediately puts you in a position where you have minimal leverage and no upper hand. If you have 3 months left on your lease. Or if you are growing and need more space ASAP. If you wait too long, you will be closer to the lease expiration and the landlord will be gaining the upper hand because they know you can’t move by starting the process so late. If you do not start your search in advance, you have lost your leverage from the start. So, use time to your advantage and you will have no problem securing a reasonable deal. 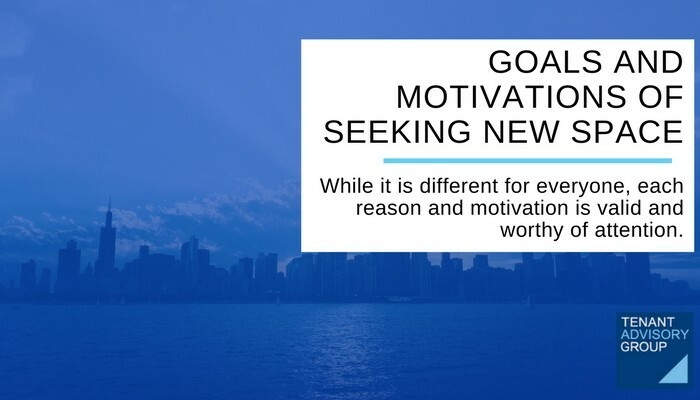 While it is different for everyone, each reason and motivation is valid and worthy of attention.